The College of Architecture, Planning and Design will host Thomas Woltz, landscape architect FASLA, CLARB, at 4 p.m. Feb. 29 in the K-State Student Union's Little Theatre as part of its Distinguished Lecture Series. Woltz will present, "Redefining the Productive Landscape: The Conservation Agriculture Studio at Nelson Byrd Woltz Landscape Architects." This event is free, open to the public and supported in part by the K-State Fine Arts fee. Woltz is the owner of Nelson Byrd Woltz Landscape Architects. The Wall Street Journal Magazine named him the Design Innovator of the Year in 2013. In 2011, he was invested into the American Society of Landscape Architects Council of Fellows, among the highest honors achieved in the profession. During the past 19 years of practice, Woltz has forged a body of work that integrates the beauty and function of built form and craftsmanship with an understanding of complex biological systems and restoration ecology that has yielded hundreds of acres of reconstructed wetlands, reforested land, native meadows and flourishing wildlife habitat. 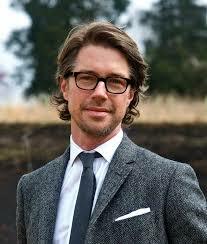 His design work infuses places where people live, work and play with narratives of the land that inspire stewardship. Many of these projects focus on restoration of damaged ecological infrastructure within working farmland and create models of biodiversity and sustainable agriculture. Woltz was educated at the University of Virginia in the fields of architecture, landscape architecture, fine art and architectural history. He holds master's degrees in landscape architecture and architecture. After working in Venice, Italy and Paris, France, he returned to the U.S. to launch his career in landscape architecture. Current work includes projects at Hudson Yards, New York City; Memorial Park, Houston, Texas; Devonian Botanic Garden Alberta, Canada; and Cornwall Park, Auckland, New Zealand. Woltz serves on the board of directors of the Cultural Landscape Foundation and the Municipal Art Society of New York.